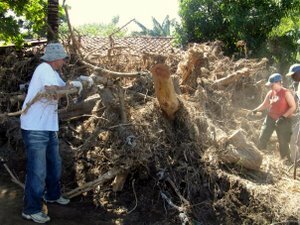 The destruction in El Salvador left by Hurricane Ida was a hard thing to see for the first Fuller Center Global Builders team to arrive since the mid-November storm. Many members of the team, most from Hammond, La., had seen that kind of damage before. "Hauntingly familiar and painful, the houses bore the same ‘water lines’ we had grown accustomed to seeing after Hurricane Katrina," team leader Tamara Danel said. 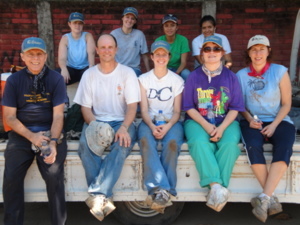 Many of the eight team members had been to El Salvador before. But they spent most of their Nov. 21-28 trip in a community in Santa Cruz located downstream of the flooded Huiza River. "Our group really wanted to build houses in Villa Fuller," Danel said, referring to the ongoing Fuller Center project in San Luis Talpa. "But once they experienced the importance of cleaning out the flooded village, they found it was just as rewarding as building someone a new home to get them out of substandard living conditions." So that’s what they did for four days in the devastated village of Melara. They worked clearing debris from within and around homes. And, they provided a few meals to villagers, including on Thanksgiving. "I enjoyed helping people who had their life turned upside down," Dale Peyroux, a veterinarian from Hammond, said. "The temperature was hot and the work was hard, but the feeling that we got from helping made our efforts worth it." They brought clothes, medicines and $1,000 to donate. And on the fifth day they even got to work in Villa Fuller, pouring a concrete foundation. "With a significant language barrier, we were able to understand one another minimally, but the love and happiness we created by helping spoke loud and clear," volunteer Ashley Peyroux said. 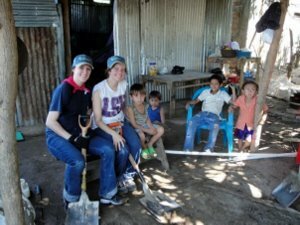 "This was probably the most life-changing mission trip I’ve ever done," Emily Danel, Tamara’s daughter, said. Tamara, a member of the Fuller Center International board of directors, compiled more stories and reflections as part of an editorial she submited to her local newspaper the Hammond Star. You can read the entire editorial about the Fuller Center Global Builders trip here. And check out this gallery of PHOTOS from the trip to El Salvador! The work began before the team arrived and will continue long after. Here’s what’s been accomplished and some of what’s to come. We have now cleared over 20 homes and counting of sand and debris, reopened eight streets, and completely demolished and rebuilt one house. In coordination with Tamera Danel’s Global Builders team and the Union Church of San Salvador we have been able to provide several meals to the people of the community as well as distribute food and household staples to 34 families. While the major work in restoring the physical layout of the remaining streets and homes will likely be complete after the efforts 31 volunteering next week, we are making plans to establish a long term relationship with the people of this area. It is our hope to not only return the community to the way it looked before the storm, but to improve many more aspects of these people’s lives. El Salvador could use your support moving forward. Donate to the relief fund here. Visit the Fuller Center El Salavdor’s Web page to learn more.